Reed’s Homophones is the handiest reference available on homophones or homonyms — words that sound alike but are spelled differently — as well as words that are often mistyped, misspelled, misused, misunderstood, or that otherwise faze (not phase) writers and confuse readers. Think, for example, about a lady from Maine who’s proud of the mane of hair that is the main attribute of her beauty. Or imagine a realtor who might cite the sight-lines of a property’s site as a selling point. And think how often those words are misused in newspapers, magazines, and elsewhere. Why such confusion? Because English begs, borrows, and steals words from every language on earth, leading to utter confusion on the part of anyone trying to master it. “Bistro,” meaning a café, derives from the Russian word meaning “quickly,” and “café” is the French word for “coffee” (which derives from the Turkish “qawha,” apparently named for the “kaffa” area of Ethiopia where the plant originates). “Sheik” is Arabic; “qi” is Chinese, “data” Latin, and “tarantula” Spanish, and “language” came to us via French from the Latin “lingua,” meaning “tongue.” Americans adopt those words and adapt them to our pronunciation models, often making their meaning unclear. To write correctly, it’s important to know which word is the one you need — because while spell-checking software can recognize whether or not you’ve spelled a word correctly, it can’t figure out which one you meant. Reed’s Homophones just might help you catch errors before it’s too late — say, when you have egg on your face. A. D. Reed spent more than 25 years writing ad copy, marketing materials, fiction, and nonfiction as he worked for large corporations, small retailers, nonprofit organizations, and monthly newspapers, while also editing the work of scores of other writers. His first book project was as a proofreader for Simon & Schuster’s Webster’s NewWorld Dictionary, Third College Edition; he currently copyedits the Asheville (NC) monthly The Urban News. Reed has served as the editor of more than a dozen books, including Barry Burgess’s Mombie: The Zombie Mom; Dave Richards’s Swords in Their Hands; Sarah-Ann Smith’s Trang Sen; Prof. Mallory McDuff’s Natural Saints and Sacred Acts, and many others. Bad writing reduces him to tears or laughter, but he has always enjoyed turning mediocre writing into sparkling prose and helping good writers make their texts even better. (Happily for poets everywhere, he would not dream of trying his hand at editing poetry!). His years of editorial experience, coupled with unending encounters with journalistic word-use solecisms—whatever happened to newspaper copy chiefs and magazine fact-checkers?—inspired him to compile Reed’s Homophones, his collection of confusing, misused, badly chosen, and incorrectly spelled words that cause headaches and pitfalls for every writer and are especially problematic for speakers and writers for whom English is a second language—or a third, fourth, or fifth. 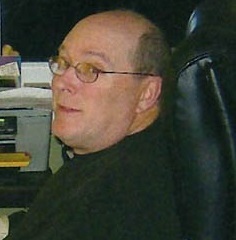 Reed has also worked as an actor and director in regional, professional, and community theaters and puts his marketing skills to work for such major events as Asheville’s Martin Luther King Prayer Breakfast, held annually since 1982, and the renowned Spring Herb Festival, the largest in the United States and Canada, held each spring held at the WNC Farmers Market. Move over, Webster, Oxford, Partridge and Roget, and make room on the bookshelf for Reed. I prophesy that Reed’s Homophones will be as well-thumbed as any of them. If only this book had been around when I was riding herd [heard] on newspaper reporters; just think of how many blue [blew] pencils I could have saved, how much aggravation we would have been spared. So thank you, A.D. Reed … better late than never! I’ve done editing since the 1960s, and this book is an essential tool for combating Spell Check. For anyone who believes that “Spill Czech cant bee beet four-hour porpoises,” Reed’s Homophones is an absolute blessing. Reed’s Homophones is the handiest quick reference on this subject. Writers, editors, students, teachers, business and government folks—I can’t imagine anyone anywhere in the world who would not welcome this chance to make the world of words a friendlier place. Even prophets may profit. Mastery would not take long, but stopping once you start—as with whipped cream or kissing—may take more will power than most folks have. 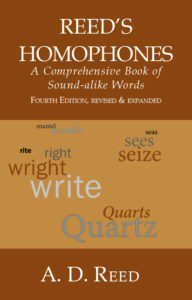 When I conducted writing lessons in middle school and high school, I was always asked, “Does spelling count?” I would usually say, “Spelling counts especially when you are spelling a different word from the one you meant to use.” Now comes A.D. Reed’s Homophones, a compendium to help students find the right word for the right meaning. Whether one calls these mistakes malapropisms or mondegreens, a misspelling or a mispronunciation, Reed’s Homophones is a perfect resource for students to have alongside their Roget’s Thesaurus and their Webster’s Dictionary. This slim gem of a book belongs on every reference shelf, whether for the professional writer or those who write simply for pleasure. This is an invaluable addition for those who love accuracy and polish in their writing. Written with a deft touch and flourishes of humor, this book should not be missed.